A legend was born at LSU fifty Halloween's ago when Billy Cannon returned a punt return against Ole Miss to win the game and secure the Heisman Trophy. If you know anything about LSU football, you know the play is simply referred to as "the Punt Return". It lives on to this day. It was, and still is, that big. The game itself was that big. Cannon covered 89 yards spectacularly, when he probably should have netted about nine, by breaking tackle after tackle. LSU was ranked number one in the nation, Ole Miss number three. Each team had allowed only one touchdown in their previous seven games. This famous run would be the only touchdown allowed in Tiger Stadium this trick-or-treat night in 1959. 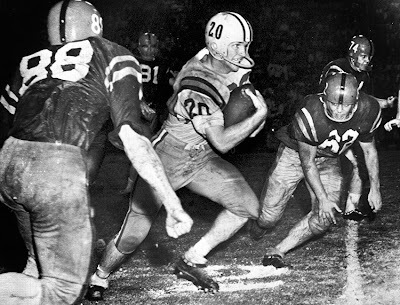 The run is half a century old, and the legend Billy Cannon lives on as well. Perhaps somewhat battered and bruised by the trials of life, but still intact nevertheless.